2)	put down landscape fabric, also known as "geotextile", then footing, in heavily traveled walkways, driveways, aisles and runways. The landscape fabric ensures that the dirt already there stays there. Rainwater can still soak through the landscaping fabric, so it won’t pond. 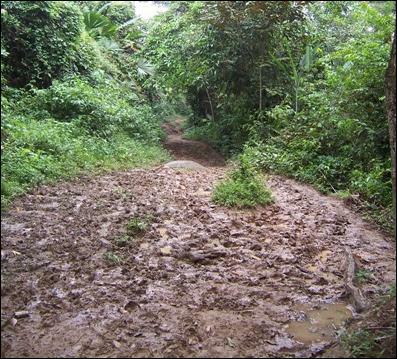 The footing raises the vehicle tires, people feet and animal feet above the dirt and the water level even during downpour events. Dirt stays where it belongs, rainwater either moves down or sideways without making contact with feet, boots or tires, and everyone stays cleaner.